One of my favourite Winter cut flowers is the hyacinth - they are so fragrant, just one stem can fill a kitchen with a lovely sweet scent. 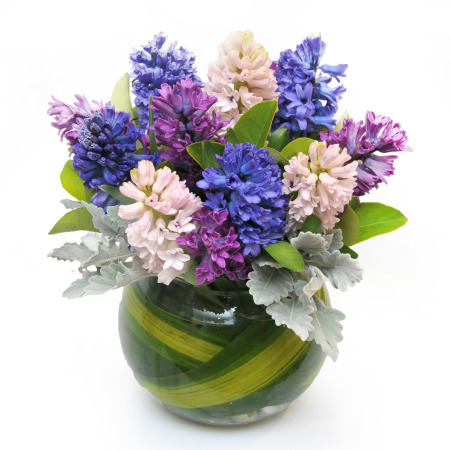 Hyacinths are thought to symbolise constancy and sincerity. Although they come in a range of colours, most of us are familiar with the blue/purple hyacinth. In Sydney, we buy hyacinths at the flower markets as a cut flower through the Winter months. The best time to buy Hyacinth cut flowers is when the lower petals have coloured and are just starting to open. In a cool environment with fresh water replaced daily they can last well over a week, making them an ideal gift. Hyacinth pot plants are available at the Flemington markets from late April. It's best to choose a sturdy, well-shaped plant with shiny, healthy foliage and bright, clear-colored flowers. Flowering plants are a wonderful gift because they can be replanted. Here, one of our talented florists, Sarah, arranges pink, mauve and purple hyacinths into a fishbowl vase for our Dusk vased arrangement. Happy leaves are wrapped inside the vase and the dusty miller foliage adds a silver touch. Take a look at this minute-long video for more of an idea!